Miguel Cabrera, first baseman and hitter extraordinaire, has just signed an eight-year extension with the Detroit Tigers worth $248 million, according to Jon Morosi of Fox Sports. 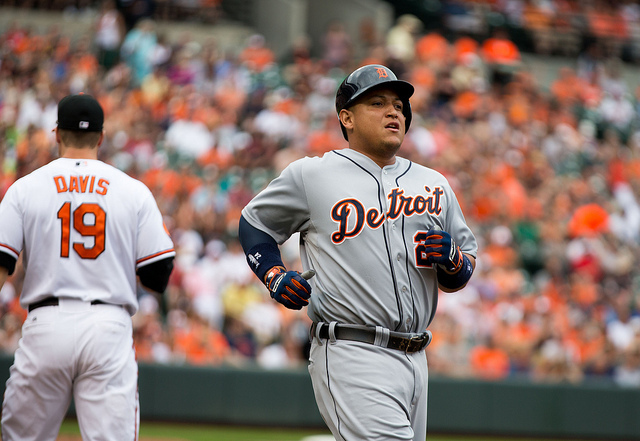 Cabrera, 30, is coming off of his fourth straight All-Star season and his second consecutive American League MVP award. With two years left on his current deal, the Tigers have effectively paid for the next ten years of Cabrera’s career. Whether or not that’s a good idea is anyone’s guess. Sure, Cabrera’s in what Deadspin calls ”the prime of his prime” right now, but as that blog points out, “No one, not even a player as durable as Cabrera, can be the same hitter at age 40 as at age 30.” As it stands, Cabrera will be under contract until 2023. He has been with the team since 2008. Last season, the Tigers finished 93-69, losing in the ALCS to the eventual world champion Boston Red Sox. The team looks to stay competitive after contract negotiations with the 2013 Cy Young winner, Max Scherzer, hit a snag earlier in the week. It was reported that Scherzer had rejected an offer that would have made him one of the highest paid pitchers in baseball, according to the Tigers. Haven’t heard as much disgust over a contract from rival execs since the Jayson Werth contract. Industry is in shock over the Cabrera deal. The Lions may have been motivated by a number of factors, but most reasonable takes (and some unreasonable ones) struggle to see the light. Some guess that it was inked in order to explode the price of the Los Angels Angels’ impending deal with soon-to-be-wildly-wealthy Mike Trout. The ball club may have wanted to begin the contract negotiations early — again, Cabrera wasn’t set to be a free agent until 2015 — to ensure that the first-baseman was locked in to a long-term deal, but that usually results in a hometown discount, not a massive deal. On the other hand, Cabrera can hit. He can hit like no one else. And baseball teams routinely chalk up the back ends of these contracts, the years when it’s brutally obvious that the player in question isn’t worth what he’s being paid, as the cost of business in the MLB. It’s what happens when there’s no salary cap. But a one-team bidding war just seems silly to us.